Fabian Kruger stars as a sharp-tongued boor who wakes up one morning with sand in his bed, which he quickly discovers is coming from him. As the days tick by, the finely ground quartz (containing increasingly soporific properties) continues to cascade from his sleeves and cuffs, with nightmares of lovestruck encounters with his downstairs waitress neighbor (the charming Irene Brugger, billed here as Frölein Da Capo) growing more and more vivid. 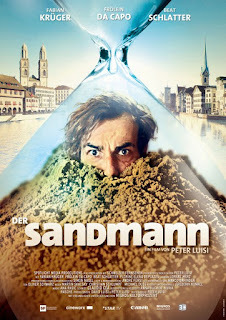 Hilarious, touching and deeply romantic, this droll little surreal Swiss comedy instantly secured a spot as one of my favorite flicks of the 2012 Brussels International Fantastic Film Festival (where it received a Special Mention from the European Jury).